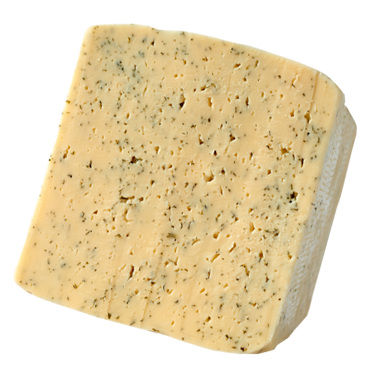 This soft, creamy and always-inviting Danish cheese was invented by Hanne Neilsen in the mid-1800s. She named her washed curd, slightly sweet cheese “Havarthi,” after her farm. In Wisconsin, we love this rindless melter, with its tiny pinprick holes or “eyes”, straight-up or studded with dill, caraway or other herbs. However you prefer it, we think versatile havarti is underrated. Not by us, mind you. In Wisconsin, havarti is a conversation stopper. When it’s in the house, Wisconsinites are concentrating on the task at hand: getting some havarti before it’s all gone. Havarti slices best when it’s well-chilled. Spray your slicer with non-stick vegetable spray, and place deli paper between each slice so that your slightly moist havarti slices won’t stick together. Havarti is easy to pair and you really can partner it with just about any drink that sounds good in the moment. If we were pushing your havarti-filled cart in the beer aisle, however, we’d fill it with weiss beer, doppelbock, stout or ESB. Wines that we matchmake with havarti include buttery chardonnay, riesling, sauvignon blanc, beaujolais or an on-the-lighter-side pinot noir. Creamy Havarti is great for melting, so we love to bake with it. We’ll take a half pound piece of it, wrap it in puff pastry, brush on egg wash, and bake it at 425 degrees Fahrenheit until it’s golden brown. Serve it hot on a large platter surrounded by fresh fruits, nicely crusted breads and crispy crackers. It’s great at room temperature too with honey, jam, fruits and veggies on a cheese board, as well as on tasty sandwiches of all stripes.